Anne Midgette of the Washington Post wrote a sobering review of Eric Booth and Tricia Tunstall’s recent book “Playing for Their Lives”. As the Executive Director of the El Sistema inspired program Play On Philly and founding Board Chairman of El Sistema USA, I would offer a few answers to the questions that are at the heart of her critique: What is El Sistema and what is it actually accomplishing? I define poor from the pre-Latin word pau-paros, which means “producing little; getting little”. My travels around the world have taught me that where some lack in material things, they make up for it ten-fold with compassion and love for their environment, family and health. With that in mind, teaching poor children to play classical music does not stamp out poverty, but helps them produce much and receive what they need to balance out the absence of material things. You wouldn’t want your pilot to have just 200 hours of flying time, and I promise that you wouldn’t want to listen to a musician with a similarly low number of hours of experience in a practice room. Any vocation requires “rote drill work” for mastery and the discipline learned through that experience directly translates to one’s life. The scientific community calls the skills gained through such practice – skills like impulse control and working memory — executive functioning skills. The Los Angeles Philharmonic has recently partnered with Stanford University to measure the effects of their El Sistema inspired program. Play On Philly has some of the most promising executive functioning research in the country and WolfBrown has expanded its work to measure similar outcomes in a dozen programs in the United States. The Scottish government continues to fund the Big Noise program, which has the most impressive outcomes of any El Sistema inspired program in the world. These are simply three examples of the dozens of research studies currently underway. As the authors of “Playing for Their Lives” suggest, it is too early to claim definitive evidence of all of the social benefits these programs provide, but intense and dedicated study of music builds executive functioning skills and that is a fact. Every day, our students’ practice with instruments helps them practice these skills: the regulation of complex cognitive processes like working memory, reasoning, flexibility, and problem solving as well as planning and execution. We know that those who posses these skills will out-perform those who don’t have them and we are confident that learning to play music is the best way for our young people to acquire them. No one working on the ground thinks the El Sistema philosophy is a magic bullet. I have yet to meet a parent, student or teacher who believes that a music program alone will provide everything that they need to overcome all of the many, systemic challenges that underserved families in our communities face. However, everyone on the ground knows that forward progress in life is made through a lot of hard work, dedication and persistence. These children, with the enormous amount of effort they give to their musical endeavors, are producing much, and getting the barest fraction of what they deserve. With all this said, I wonder, would you still call them “poor”? Each day, as I watch them earn the support of a community of music educators who have united with them and their families to build these critical skills, as they tackle the next measure of music, the next recital, the next concert, I hope they feel like the richest kids in Philadelphia, playing for their lives each and every day. Well stated Stan! Great that you are helping to lead the charge for El Sistema USA. Thanks for your response. So well done. I believe one would have to be working for a good while in such a program to really understand. The tendency to triumphalism (or language that has that tone) is so strong for anyone building something worthy, whether it is a Sistema type program, another “social” program focused on developing abilities, or certainly programs in many public and independent school programs. This triumphalist attitude tends to separate us rather then unite us. Your focus on the children and families, your practice, and thoughtfulness serves to avoid that pitfall. Continued best wishes. It’s important to put Midgette’s comments in the context of her larger worldview. She is by no means impartial. She and her husband, Greg Sandow, champion the neoliberal/postmodern philosophy that the market should be the ultimate arbiter of almost all human endeavor, including the arts. It is thus no surprise that she casts dispersions on El Sistema, that program associated with the evil Chavistas and socialism. Both Midgette and Sandow come from very wealthy families. The old oligarchic power structures of Venezuela are more in line with their perspectives and privilege. If Midgette, a big opera fan, were really concerned about social justice and systems for the support of music, she might write articles about why Washington, D.C. with the 11th largest metro GDP in the world, only ranks 118th in the world for opera performances per year. It is far outranked by little European cities only a fraction of the size. This abysmal situation is created in large part by our system of funding the arts by donations from the wealthy – a method found in no other developed country. We wouldn’t, of course, expect wealthy folks and corporate newspapers to come down too hard on our dysfunctional plutocratic system of arts funding? Better to cast aspersions on those evil socialists. William Osborne: it seems a little far-fetched to put Midgette’s critical review down to a distaste for socialism, given that she doesn’t mention socialism and El Sistema isn’t a socialist program. It would be hard to find a more conservative figure than El Sistema’s founder, José Antonio Abreu, who was a close associate of right-wing politicians and business figures in his youth and reached the summit of his political career as a minister in the neoliberal government of Carlos Andrés Pérez. His marriage with Chávez was most definitely one of convenience. If she’s very mildly skeptical of El Sistema, it’s because – unlike most arts journalists – she’s actually looked at a bit of the research on it, rather than relying on Wikipedia. But the real object of her skepticism is neither El Sistema nor Sistema-inspired programs, but rather the book itself and its authors – and in this she is right on the mark. I think the problem with this view is that it focuses too much on Abreu and too little on the larger context of Sistema, which is culturally isomorphic with the spirit of revolution that imbues Venezuela. And that it is why Sistema-like systems in the USA aren’t having nearly the same effect. Far from being connected to a sense of revolution, they are placed in the context of ghettos that have faced political and social stagnation for decades. There’s a sense of hopelessness, that nothing is going to change. Sistema styled youth orchestras in America come from almost the exact opposite philosophy, another project of rich, white, do-gooders who will not even consider the systemic transformations needed to bring an end to our racist, economic class system. And believe me, people with Midgette’s perspectives are not going to do much to bring that sort of social transformation to America. As for larger issues in your book, such as the authoritarianism, hierarchies, regimentation, and patriarchy of orchestras, and the troubling aspects of using that as model for social change, we are in agreement. But in the conditions of Latin America, this is one of the least of the problems. 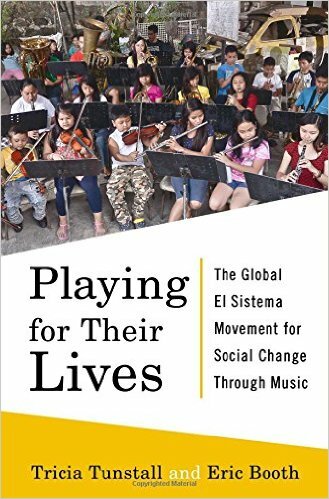 1) The average El Sistema inspired program in America is less than four years old. Across the globe, about six years. El Sistema in Venezuela is coming up on 42 years this winter. I am not sure if you are aware how difficult it is to run an organization AND deliver programs to the communities we are trying to help. Trying to run a revolution is not only incredibly difficult, but probably not the best way to win the support of the various types of stake holders one needs to be successful. 2) I am very curious what experience you have in “the ghettos that have faced political and social stagnation for decades”? First, these issues have been around for centuries, not just decades. Second, there is a tremendous amount of hope in the communities we serve. Your comment certainly doesn’t come from the perspective of someone who has there feet on the ground and in the trenches, but I could be wrong. 3) You couldn’t be more wrong about the types of people working to implement Sistema-style programs. I do not fit any of those categories that you mentioned, and the vast majority of folks running programs do not. We are well aware of the systems we are trying to disrupt. Do you have any solutions we can keep in mind as we continue to make progress? I want to welcome both you and Geoff to Philadelphia to spend time with me, my team and students. I think you’ll see a completely different picture than what is, largely, in your minds. Perhaps you know of large scale organizations and companies that can thrive off having no one in authority or hierarchies of command. Perhaps you know of quality artists and professionals who haven’t been trained through regimentation. Let me know where you have found success in the opposite. However, you must know the struggles of women and people of color in this country who can’t get ahead because those “in power” are just not ready to relinquish it. Like I was given the opportunity to develop and grow an organization like Play On Philly, I hope I’ll be given the opportunity to be able to affect the larger systemic issues our children, communities, and organization face.